Born and raised in New York City, Dr. Nicolosi first trained and practiced as a lawyer. 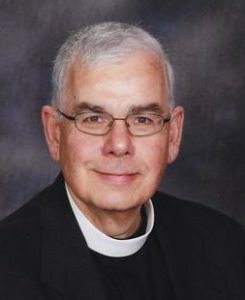 As a candidate from the Diocese of Niagara, he received a Master of Divinity Degree from Trinity College, University of Toronto, and was ordained in 1983. His first parish was Malbay, Gaspe Coast in the Diocese of Quebec. He subsequently served parishes in New York, Pennsylvania, California and New Jersey. His Doctoral Degree in Ministry was completed in 1997 at the Pittsburgh Theological Seminary. From 2007 to his current position, he served as the Congregational Development Officer of the Diocese of British Columbia in Victoria. Dr. Nicolosi served as the Eighth Rector of St. James Westminster from 2010 until his retirement in 2016. Dr. Nicolosi is married to Ontario-born Heather Bruce and they have one daughter, Allison. By way of illustrating our small world, Heather’s sister and family live on Ridout St. South in London ON. Dr. Nicolosi now resides with his family in Arizona.